Underground musicians in the Jordanian capital are on a mission: to resist the mainstream. It isn’t visible from the sidewalk, and you have to know your destination in order to find it. Go down a set of stairs leading from the street in Amman’s commercial Swefieh neighborhood, and you’ll find iPlay, a small music school and store that is one of only a handful of spots in Jordan’s capital selling musical instruments that don’t cater to traditional Arabic music. Violins, a few keyboards, drum sets, and finally a rack of acoustic and electric guitars are on display. A customer, in his early twenties, picks up an acoustic guitar from the display and fills the room with a beautiful flamenco tune while Wassim Qasis, an employee, restrings a guitar on the counter. On the other hand, mainstream Arabic pop music, with artists mainly from Egypt and Lebanon, tends to be far more popular and draw larger crowds. “Most of the people here, if they want to go out to see an Arabic singer, they’ll find a big audience. It has a big base here,” says Baha. This leaves few outlets for non-mainstream music. Amman offers a handful of Western Top 40-style radio stations as well as a classic rock station, but these sources hardly reflect the styles of the city’s numerous independent artists, who are exploring an eclectic variety of less-mainstream genres from blues to jazz fusion to electronic. Amman also offers precious few live venues for musicians to perform their work and share new sounds. Go back several decades and it’s a different story altogether. William Khoury, Jordan’s first professional DJ, recalls a time in the ‘70’s and ‘80’s when Amman’s music scene felt a lot more like that of Beirut, the city famed as the party capital of the Middle East. When William visited the coastal Lebanese city during the late ‘70’s, during the start of Lebanon’s fifteen-year civil war, he was inspired by the upbeat, carefree vibe of the nightlife. “I went to Beirut and I just couldn’t say a word. They did it right – there was taste.” All this was despite the bloody sectarian violence raging in the tiny Mediterranean state. “The Lebanese people don’t care if there’s war.” To William, the party and the music seemed to simply go on. WILLIAM brought the party back home to Jordan at the height of the ‘70’s disco craze. He opened a record store in Amman’s now sleepy residential Shmeisani neighborhood – only the third store of its kind in Jordan. Every several months, William would travel to England and bring back the latest foreign records to sell at his store and remix in his shows – thus becoming one of a handful of people importing Western music to Jordan, a grassroots-level effort that included anyone lucky enough to travel abroad, from like-minded musicians bringing home records from overseas, to Royal Jordanian flight attendants taking requests from friends. “The people used to come and listen to the music in my time. They were all good listeners. People knew about music,” remembers William. Joseph Zakarian, a DJ and electronic musician, sees a different reality today. 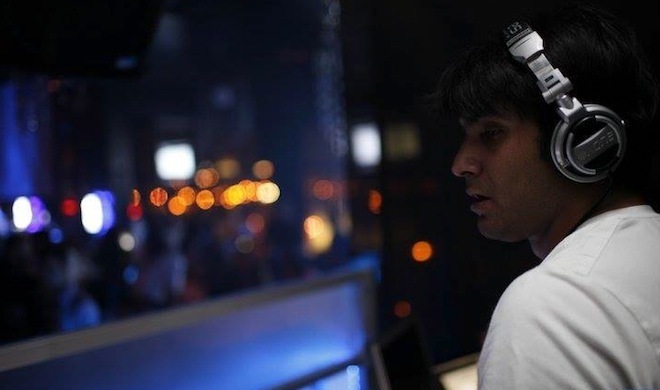 A veteran of Yerevan, Armenia’s underground music scene, Joseph recently moved back home to Amman to seek out music and other artistic opportunities. He has done shows around the world, and notices one similarity everywhere – people stick to mainstream music whether they live in Miami, Florida or Tehran, Iran. “It’s not only an issue in Jordan. You can’t blame Jordanians for only listening to the mainstream,” Joseph explains. William sees the struggle of independent music in economic terms. “There is an audience – I’ve seen many people – but there’s no place to listen to the music and there’s no place to play the music because they can’t afford (to open new venues). The economy is bad. If you want to open a place, it will cost you a mountain.” That’s why it is difficult to go out and see independent musicians perform – despite the fact that they most certainly exist. But not everyone knows they exist. Jordanians have an unfortunate – and untrue – reputation in the Middle East for being too serious to have fun. Jordanian musicians are changing this unfounded reputation for the better. Arabic-language indie rock bands like Autostrad have slowly but surely been making a name for Jordan. The band, which infuses lyrics about everyday Jordanian life into its music, performs around the region, with recent appearances in Lebanon, Egypt, and the UAE. Other musicians like Aziz Maraka have pioneered a genre known in Amman as Razz – Rock, Arabic, Jazz. In 2010 Maraka created an event called Bands Across Borders, which brings musicians from across the world to Amman to collaborate and share their sounds. Music festivals are slowly on the rise in Jordan’s capital city. The fourth edition of the annual Amman Jazz Festival, which took place in late April, gathered a diverse array of jazz musicians of all styles from the Middle East and the rest of the world. “Any type of genre you can think of – there’s someone playing it in Amman,” asserts Rami Khoury, William’s son and a guitarist currently specializing in jazz fusion. IT’S TRUE – there have always been traditional Arab music styles permeating Amman, and Arabic pop is the mainstream both in Jordan and the rest of the region. Yet the scene for independent musicians pursuing different genres and styles of music presents extreme difficulties.